Heffy Doodle + MISTI Blog Hop! 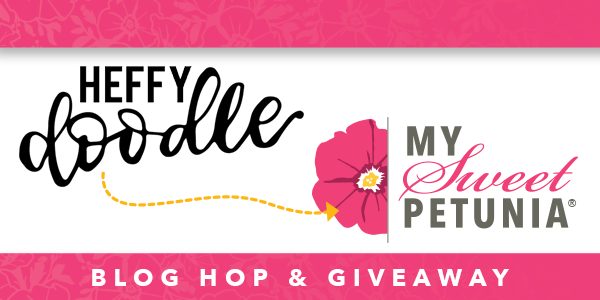 Thanks so much for joining me today for the MISTI and Heffy Doodle blog hop, celebrating Heffy Doodle's Release 3. Let's take a second to talk about the MISTI. In case you are still not sold on whether or not a MISTI is a good investment, let me just tell you that I use mine almost every day. Recently, I also added the MISTI Creative Corners to my crafting stash, and I waited WAY too long to get them. I find I can mass produce cards so much faster when I use the MISTI. If you're still on the fence about whether or not to invest in a MISTI, hopefully this blog post will convince you! One of your favorite things to use the MISTI for when you get one will be to create backgrounds more easily. I used my MISTI to create this background for today's card. I started out by arranging the images from the Honey Bunny Boo stamp set on to my card panel. Then I closed my MISTI door on to the panel to pick up the arrangement of the stamps, inked them up with black ink and stamped them down. THEN, the beauty of the MISTI comes into play here. I just rotated my card panel and inked up my images and stamped them again. I just had to arrange the images one more time before stamping and rotating my panel one last time, and then--VOILA! Background totally done! Using the MISTI really cut down my time creating this background, and I only had to arrange the stamps two times. The background is evenly spaced and lovely because of using the MISTI. I used my Prismacolor Colored Pencils to color the background and then colored the bunny images, too. I used my Spectrum Noir Shimmer Pen to color the images for added shine, too. I trimmed down a smaller panel and stamped my sentiment first, to make sure that I could fit it all on the panel. Secret time! 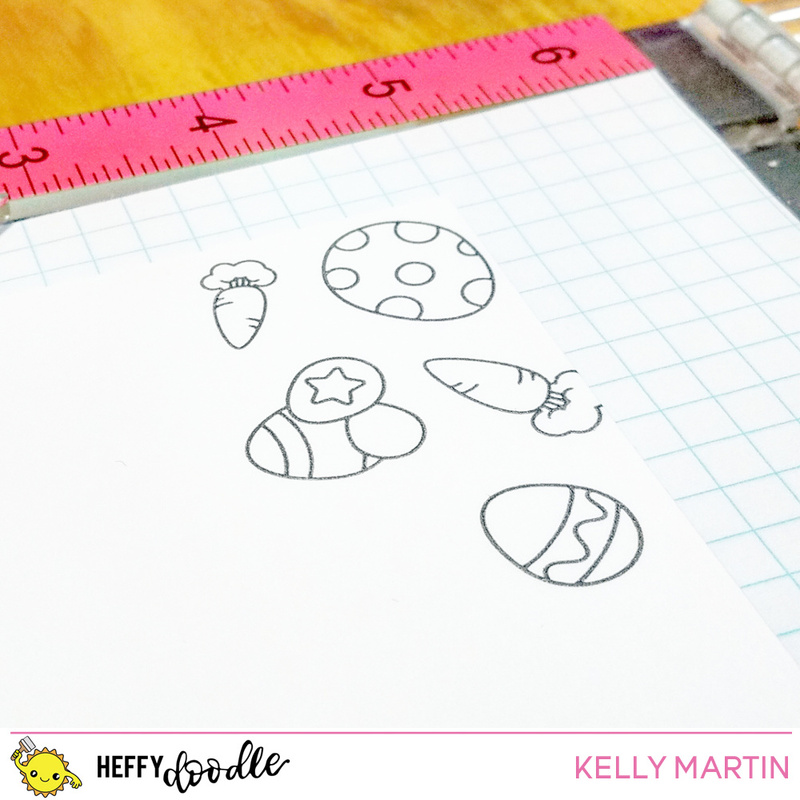 I used the sentiment stamps from the Eggcellent News stamp set since they were baby-themed! I love combining sentiments and stamps from different stamp sets to create customized themes on cards. And for the sentiment stamping, I also used my MISTI, because this ensured that I stamped the sentiment straight and evenly spaced. I also used the heart image from the Eggcellent News set and chose some various Hero Arts Bold inks on the sentiment panel. I also covered the heart images with Glossy Accents for added dimension. I trimmed down my background and glued it on to a piece of lime green cardstock that I had in my scrap drawer. I then die cut my sentiment panel using one of the dies from the Lawn Fawn 4 Bar Stitched Rectangle Die set. I glued some foam under the panel to pop it up from the background, and then for one more level of dimension, I popped up the bunny images from the sentiment panel using foam tape. We will choose two lucky commenters from the hop to win one of two prizes: a $50 shopping spree at www.mysweetpetunia.com, and a 25 pound shopping spree at Heffydoodle.com . You must leave your comments no later than Sunday, March 4th at 11:59 PM Central time. Winners will be announced on Tuesday, March 6th on the Heffy Doodle and My Sweet Petunia blogs. Good luck and enjoy the hop! Thanks for stopping by today! Love the way you were able to use the Misti to stamp the background by just turning the paper! Great card and tip! So cute! Great job creating your own background paper! Beautifully done! Such a sweet card and so pretty!! So soft and cute. Love the soft colors, design, and background tips. A lovey giveaway. Thank you for your inspiration! Love the background you created! The baby card turned out so darn cute! Thanks for the inspiration ! A Great idea for the use of the Misti to create the background for such an adorable card. SO ADORABLE!! And I totally love the background stamping! Wonderful card! So different from the standard "new baby" type card. Darling baby card! Love those sweet bunnies! Your card is adorable and perfect for the "spring babies" ! Your card is very beautiful! Thank you for sharing! Love the background you created for these sweet bunnies. I love your design! Really beautiful! Thank you for sharing your creativity! So cute! I love that you made this into a baby card! I've got the creative corners for the Misti on my wish list! Such a cute idea to use these little bunnies in a baby announcement!!! I love how you used the Misti to make the patterned stamped background :) this card is precious and so very creative! Thanks so much for sharing!!! What a great background image you made! I love all the sweet, spring colors with the white bunnies. Thanks so much for sharing your technique and card with us! Love the background you stamped it really makes it all come together. What an adorable card! Love the stamped background you have created! Zen Garden Release Blog Hop Day 4! Lucky Charm Release 3 Blog Hop and Giveaway!